Although it’s the 21st century, fake calling still remains a popular method of scamming, pranking, and even scaring people. Fraudsters and pranksters alike use the old fake call trick to gather valuable information from innocent victims. Because of this, we are less trustworthy of unfamiliar numbers – and as a result, we miss important updates from doctors, schools, airlines, and job offers. Technology has made it easier and cheaper for scammers, pranksters, and telemarketers to call you, making it difficult to identify and deal with a fake call. Fortunately, apps like TrapCall are there to help. TrapCall allows users to unveil the true identity of those private, no caller ID, unknown and restricted numbers and block those unwanted callers! In this post, you’ll not only learn how to deal with fake calls but how to stop them for good with TrapCall! But first, what types of fake calls are out there? There are many types of fake callers out there, ranging from your mischievous friends to experienced phone scam artists. However, the types of fake calls you can receive can be classified as either blocked or spoofed numbers. You’ll know you’re getting fake calls by the many blocked, no caller ID, and restricted numbers popping up on your phone. Blocked calls can easily be placed to your phone by dialing *67 before entering the phone number you wish to call – it’s one of the oldest tricks in the book! Because nearly anyone can call you from a blocked number, the types of callers behind private numbers can vary. The most typical types are scammers, telemarketers, or robocallers. Their intentions can range from soliciting a purchase of legitimate product or service from a legally registered business all the way to trying to scam you out of your personal identity. Blocked callers can also be people that you know. Because it is so easy to place a private call, friends or family can place a funny prank to your phone or use blocked calling to communicate with you after a conflict. Blocked callers can also be disgruntled ex-girlfriends or ex-boyfriends, a contentious family member, or even a stalker. If you do not use a call unmasking app, it can be difficult to identify who these callers are and the intentions behind their call. Because the caller’s phone number is hidden, there is no way to protect yourself from receiving another call using Apple and Android’s default phone blocking functions. The only true way to reveal the number behind a blocked call is to download a third-party app such as TrapCall that will easily allow you to unmask the person’s phone number who placed the call or calls. The most common fake calls placed by phone scammers and spammers are known as spoofed calls. Phone spoofing is the practice of tricking a phone network into thinking the originator of the call is from a location other than its actual location, allowing callers to place an outbound call from a number that is different to the one they are truly calling from. This tactic is particularly popular because it tricks call recipients into thinking they’re receiving an important phone call from their local mechanic, school or doctor. Phone spoofing allows telephone scammers to place millions of fake calls each day – each from a unique or masked phone number. Similar to blocked calls, Apple and Android call blocking cannot help to stop these unwanted callers because they will continue to call you from different spoofed numbers (especially if you answer the phone). Most third-party apps cannot help you at all to stop problem calls from spoofed numbers, but TrapCall uses advanced audio-fingerprinting technology to identify and protect you from many common spoofed number scams. First, never answer calls without caller ID information. If you do answer the call and believe the call is a scam, request to call the caller back at their number. This is the easiest way to identify if the caller is calling from a spoofed number because if you call back and the same caller does not answer – you know the call was fake. Never give out your personal information on the phone. It is unlikely a trustworthy company will fake call you out of the blue seeking your credit card and social security number. Once you learn the true source of the fake call, you can be a hero and post it on several sites, like 800notes, as a warning to others. If you get a strange fake call just put the phone number up on the site with your experience. This way people know they’re not alone! If you’re getting scammed, don’t register on the Do Not Call List. Scammers will never abide by the legal requirements of the FCC or FTC because calling you to scam you out of your money or identity is illegal. Track and block the caller with TrapCall. You can track phone numbers & calls and confront them, preventing them from reaching out to you and bothering you in the future. Now that you understand where fake calls come from, how fake callers can block or spoof their numbers, and that you’ll never be able to fully to unmask or block these nuisance calls using only your iPhone or Android – you must take matters into your own hands. The concept of the solution is simple, annoying fake or blocked callers can’t ever get you on the phone if they can’t reach you when they call. But how do you accomplish that if smartphones, phone carriers, or even government organizations like the FCC can’t protect your phone number from harassment, dangerous phone scammers, or unwanted telemarketing calls? The only way to truly accomplish this is to download a third-party call blocking and unmasking app to ensure unwanted callers can’t reach you. We highly recommend signing up for TrapCall as your best solution to stop unwanted fake calls for good. TrapCall ensures fake, spam, and scam callers are never able to reach you. TrapCall protects you from identifying blocked calls before you answer and automatically stop spam calls from ringing. 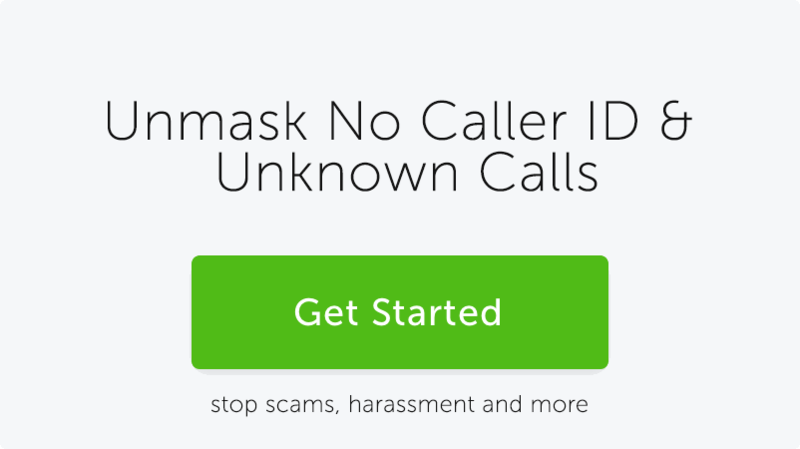 TrapCall is also the only app that offers number unmasking to reveal the true identity of a blocked caller. TrapCall is an easy investment to ensure your privacy and personal information is protected from annoying spam callers. Get started with TrapCall today!